"Disciplined Systematic Global Macro Views" focuses on current economic and finance issues, changes in market structure and the hedge fund industry as well as how to be a better decision-maker in the global macro investment space. This book is one of the best written on the impact of leverage and debt on aggregate demand. There is a lot of talk on the wealth effect, income inequality, balance sheet recession, and consumer behavior, but this one book touches all of these issues in a thoughtful manner. The authors do a great job of writing about leverage and wealth effects on consumers with clarity. They also effectively use disaggregated data across regions and income groups to provide a persuasive case for their arguments. They show the fallacies of looking at aggregate data to make generalization about the state of the macro economy. 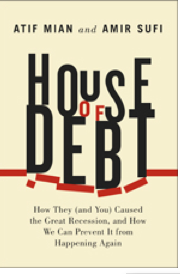 Reading this book will have a profound impact on how you look at the ravages of leverage on marginal consumers who cannot afford a balance sheet shock. If we use a simple labor scoreboard, we can see why the Fed is being careful but sketchy on what it wants to do with policy. This scoreboard of key variables is based on work presented in Institutional Investor. 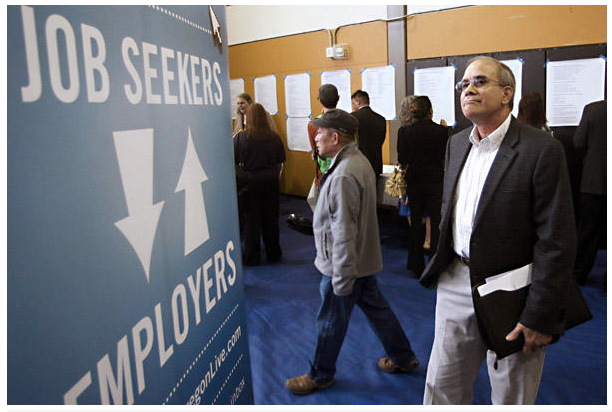 It gives a good simple picture of the labor market. All the measures have improved over the last two years, but they may not be above pre-recession levels. If we give a (+/-), the levels are close to the pre-recession levels. The problem is with labor confidence and utilization which are more forward looking measures. How these are weighed by the Fed is unclear, but if you want a clear sign for when rates will be raised look to the battery of labor stats. If there are some permanent changes to the labor market, the Fed may not have the ability to get to the magical pre-recession levels. This could be the real problem. Wilson makes a beautiful observation about complexity and reductionism. The world is filled with complexities and seemingly little connection. Celebrating this complexity gives us the uniqueness found in any art. Looking at complexity and being able to find commonality is the process of science. Science is the process of taking unique cases and observations and generalizing to find patterns. Finance and economics attempts to find the primal parts in market complexity and reduce it to as simple terms as possible. This process of reductionism si the essence of good modeling. A good model should not focus on complexity but look for ways to find commonality and reduce the moving parts to as few as possible. The portfolio structure employed by a manager can be based on the amount of information available to the manager and his skill. 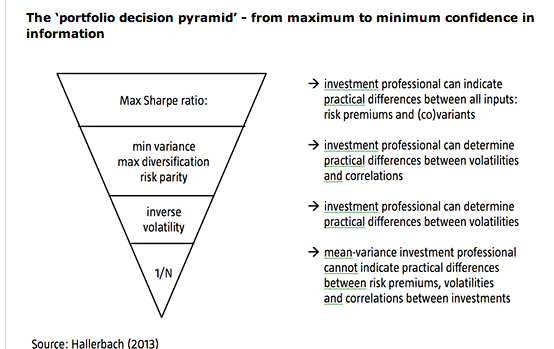 If you are at the top of this pyramid and you have an information edge, then you should use it and try to maximize the Sharpe ratio of the portfolio. This means you have some idea what expected returns will be for assets included in the portfolio. If you cannot determine the direction of the market, but you can forecast or tell something about volatility and correlation between markets, then a risk parity approach or minimum variance approach may make sense. You can use the covariance matrix to help with allocation decisions. If you do not have have any idea what the correlations across markets may look like, you may want to only focus on volatility through a inverse volatility rule. This states that the correlations are all the same across assets. If you have no idea what returns or risk may look like, the best approach is to use an equal weighting strategy. Of course, if you equally weight assets from the same asset class, you will have a problem. The 1/n rule states that you have no information advantage across any part of the returns distribution. This is a good simple way to think about portfolio construction and information advantage. Start with no knowledge and work your way up to the strong knowledge on risk and return place if you have an edge. Often times managers start at the Sharpe end of the pyramid when they belong at the equal allocation end. Rob Arnott and Research Affiliates have written a provocative paper on the risks of following life-cycle investing. There is a rule of thumb that you should take 100 minus your age to determine your stock allocation over your life. Young people should hold more stocks and as you age you should cut your stock exposure. This high stock allocation for the young is the premise of life cycle funds, but there is underling this approach the assumption that you never need the money. The cash is put away for retirement. However, there is clear evidence that young people will often have to raid the savings jar because of change in job status. If you go unemployed in a recession and you need the cash for consumption, holding risk assets may not be a good strategy. In fact, if you may need the cash at the worst time in terms of stock returns. This same argument could apply if you just make job changes and you have a cash shortfall. You have to think about short-temr portfolio performance. Stocks do poorly during a recession when you have consumption risk. This is one of the reasons why you need a premium for holding this risky asset. If that is the case, then holding more stocks when you have more employment risk is a risky investment strategy. Life cycle funds are not a solution but a problem. You might need more cash when you are young. Or, you need to hold alternatives that will do well when there are market or economic disruptions. Inflation expectations have declined significantly over the last year. Growth has slowed which is bad for real rates and the odds of rate increase have declined. Risk premiums have also declined. Risk-on still seems to rule the day even with the October scare. The downward pressure on rates has been real even with the recent reversal. There needs to be signs that these factors are changing for rates to move higher. Today will mark the end of the "Grand Experiment", but it may not have been so grand and it is certainly not an experiment after 71 months of near zero interest rates. Many are saying that the naysayers got it wrong, there has been no inflation as expected. It is true that inflation did not rise above the 2% target but it has stayed above the rest of the developed world. The EU and Japan both are fighting deflation fears. There is better growth in the US. The housing market has come off the lows of the Great Recession. Mortgage rates make buying real estate cheaper. The stock market has created a lot of wealth for those who hold stocks. Credit spreads and absolute rates make it cheaper to finance if you are a corporation. The banking sector is in better shape. Government financing costs have declined significantly. All of these key financial and economic areas show improvement, but the real question is how much worse off would be have been if less was done and rates were starting to be normalized. It is always an issue of behavior on the margin. QE was a good thing to get an economy back on track but does a good thing become a grand thing if you just do more? That men do not learn very much from the lessons of history is the most important of all lessons of history. Huxley is always good for a quote, but this is one that has stuck with me for years and has had some of greatest influence on my thinking. Markets go through cycles and repeatable events. The surprise is that we are always being surprised by events that have precedence. Credit cycles - we have had that. Bubbles - we have had those. Bank runs - we have seen it. Government intervention - normal. Central bank mistakes - check. We may still be surprised by the intensity of some events and the structure of markets are always changing, but if we have not studied the past and prepared for these events, it is our own fault. It is not the rate, but the cash flow that matters. From the latest paper by SP Kothari, we learn that interest rate declines have a small impact on whether new corporate investments projects are taken on. The key drivers are clearly an increase in profits and an increase in the return to shareholders. A increase in profits should mean that sales are improving and revenues are increasing. These are sure signs that expansion should be undertaken. An increase in returns to shareholders is telling the company that they are doing something good. The positive feedback is a reason for expansion. If the environment is better for taking on new investments, there will be new investments. The rate of interest is of secondary importance. 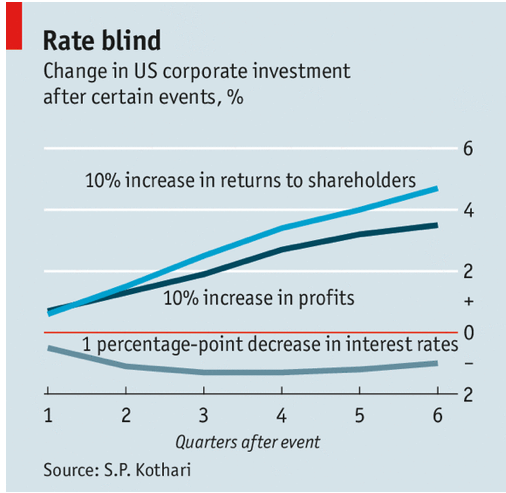 Now we have had increases in profits and increases in shareholder return, but investment has lagged. Or put differently, investments have not matched the retrenchment in consumer behavior. What is the issue? There has been an increase in corporate leverage but buybacks are not new investments. Most important, there has still been a high degree of uncertainty on the future of return on investment. This is not going to be solved with just monetary policy. The coming regulation on money market funds (MMF's) suggests that smart money is going to have to find alternatives and do it themselves. These new rules will be implemented over the next two years and will mainly apply to institutional and government tax exempt funds. However, the implications will apply to all holders of money funds. Simply put, the regulations will make money funds less money-like. In a crisis which may create "run on the bank" behavior, money funds will loose their moneyness of instant liquidity. These rules now institutionalize how and when funds will loose their moneyness which creates a new set of investor behaviors. First there will be the cash requirement that 30% of the portfolio has to be in liquid investments which means Treasuries that have zero return. That will put a yield drag on any portfolio. Second, there will variable NAV's for institutional portfolios. They will break the buck and float. It is odd that this will apply to the smart money but it will not apply to retail money. I guess you have to keep the small investors in the dark. The rule should either be applied to all or to none. There will also the potential for gates and penalties. You could be charged a penalty that exceeds the yield on the fund when the funds liquid assets fall below 30%. There also can be gate restrictions put on the funds. Now all institutions will have to watch the liquid assets and if you get close to the trigger levels you will pull your funds. This will then lead to a penalty or a gate going up which will negatively effect all of the remaining investors. These rules are in place to reduce the potential for a run on the bank. They now create some clarity on when runs will occur. Don't call them money funds because if you think these funds will be like money when you need it, forget it. That was always the case, but now we have rules in place to ensure that they will not act like money. FT Alphaville had a good discussion yesterday on the two most important questions for determining the fundamental bottom of the oil market. The burn rate for sovereigns and the break-even price for shale oil in the US. The burn rates tells us how long will reserve assets last before there will not any assets available to meet government expenditures. We know in many of these countries taxes are not going to be raised to meet budget deficits. It is all about oil revenues. If oil revenues decline, there will be a budget deficit that has to be paid out of reserves. If the burn rate is short, we know that production will have to be maintained or increase to offset price declines to stabilize revenue. If the burn rate is long, a country could cut production at lower prices and dip into reserve until prices increase. Nigeria's cash stockpile will only last about four months. For Russia, their stockpile will allow them to keep government expenditures the same for just under 4 years. Saudi Arabia has a cash stockpile that will last just under eight years. The Saudis can cut production. Nigeria cannot. This gives us some idea of production alternatives for state owned oil companies. The break-even cost of production is important for shale oil which has seen the biggest marginal increase in production over the last few years. Shale oil production is the leading supply cause for lower prices. The latest research suggests that the break-even price is now $57 per barrel versus about $70 per barrel last year. This is a big difference and a big change in the calculus of production. Shale oil producers will still push production at current or even lower prices without the risk of losing money on every barrel. The bottom line is that if you think there will be a significant supply response to the recent fall in price, think again. Output gaps are not closing, get used to it. Growth is slower around the world and there is no catalyst to get growth to increase above the pre-recession levels in order to close the gap. There has been no rubber band effect usually seen in post WWII recessions. Those who were more highly levered, the non-wealthy class, has not been able in increase consumption. They have also not participated in the wealth effect. Hence, we have growing income inequality and no increase in aggregate demand. The aggregates do not tell us about the wealth problem which exist for certain income groups and regions. The thesis that financial or balance sheet recessions take longer to unwind has proven to be true regardless of monetary stimulus. The average rebound is about 10 years. The priors tell us that we will still have to wait as balance sheet get repaired. In this period while balance sheet are repaired, we can still have "normal" business cycles and a recession. We have to accept that cyclical behavior continues even if there is a long-term balance sheet adjustment. We are in an inflationary environment. This is what many economists expected, except it is focused in the asset markets and not the real good markets. This is what many did not fully predict. This view on bubbles is now changing. There is an excess supply of good but a shortage of financial assets to meet the excess money in the economy and the high level of savings. 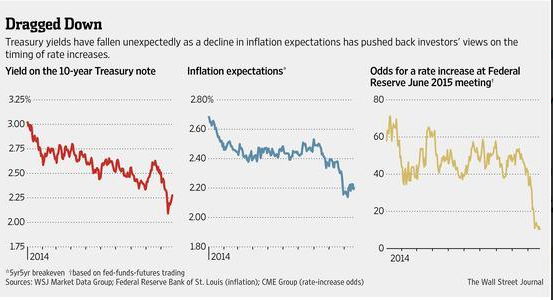 Inflationary expectations are still tamed but financial asset expectations are running wild. Money growth has declined in the US with the ending of QE, but there is a need for unconventional monetary policy in the EU and continued money growth in Japan. There will not be any return to the old normal anytime soon. The global growth rates are coming down. we have a three speed world economy, but all of those speed are slower. There is the US which is doing better than the rest of the developed world. There is the slow speed of the EU and Japan. and then there is the other speed of emerging markets which is slowing but still higher than the developed world. This tiered growth world is not changing, but the absolute growth will slow with less money and credit in the global system. Emerging markets are still tied to the money creation by the US. 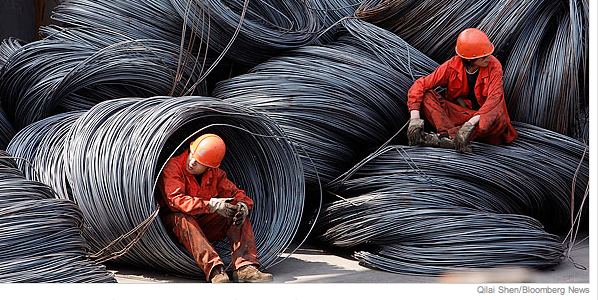 Things have not changed now that commodity prices have come slowed. Emerging markets are in better financial shape but they need outside liquidity for strong growth. The low volatility environment has existed for too long. A growing level of economic fear exists as normal business cycle dynamic suggest a potential slowdown from the trough of 2009. Normal business cycle dynamics can still exist even if we are still working though the balance sheet adjustment. The US economy is improving on a number of fronts, but the dynamics do not suggest strong above trend growth. We are lucky that lower energy costs may provide a boost for the economy. The risk-on/risk-off environment of 2009-2011 may be back. Asset class switching will dominate market specific opportunities. Investors will have to get the asset allocation right. The search of yield has not stopped. We are not in an equity bubble but a credit bubble, but this yield search is in transition with the increase in overall market volatility. Credit conditions will tighten and spreads will have a harder time tightening in a world with higher volatility. Zero cash rates are more attractive versus negative asset returns. How low can oil prices go? The answer ultimately is associated with the marginal cost of production and the profits that can be derived from pumping oil. Unfortunately, the decision to produce is affected by the fact that states are producers not just profit maximizing companies. The table above shows the break-even price for budget surpluses. 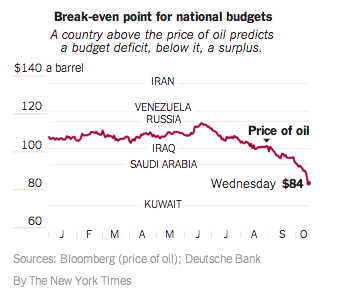 These countries need higher oil prices or they have to run budget deficits. They can offset the deficit by pumping more oil, keeping product high or higher in a declining market. Of course, their cost of production is low, so they can continue to produce and turn a profit. They will just have to dip into foreign currency reserves to meet expenditures. This can be sustained for some time. The oil produced by companies will be more sensitive to price. 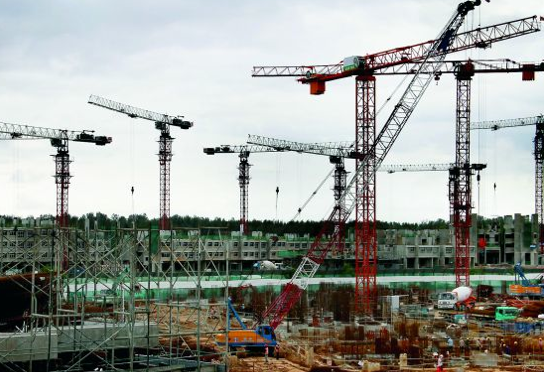 New production will have a harder time obtaining financing which will slowly reduce supply. Financing for the producer will bind behavior. The supply side of the market will not be a good help at determining a price bottom in the short-run. At issue is what will the shale oil producers of North Dakota do. Let call that area Frackentan. 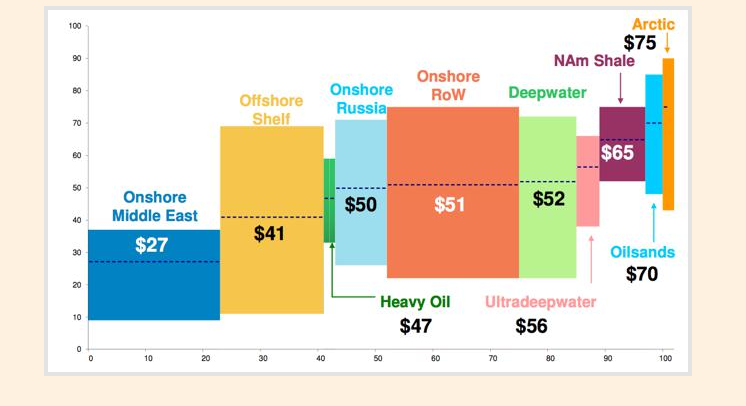 These producers have high average and marginal costs but close to a million more barrels may come on-line in the US in the next year if we are at the average price this year. The same high cost applies to tar sands in Canada. The oil market will tighten and prices will stabilize if that production does not come on-line and if current production is slowed. What we know is that production decisions will be based on longer-term price expectations and not what the price does in any given week. Even if oil prices decline further, the issue is whether they will stay low for some time. This is an issue of global demand and economic growth. The projected government deficit continues to fall. This is a good thing if you fall into the camp that deleveraging has to continue. The large deficits after the Great Recession was the government take on debt that was being reduced by consumers. However, if you believe the government needs to help the economy with more growth, this is a tale of fiscal tightness that impedes growth. The reversal of tax cuts has increased revenues for the government. No one seems to want to offer any new cuts to improve growth. No one is offering infrastructure development at the current low rates. The macro story is that the fiscal policy is not helping with growth so there is little reason to expect the output gap to close and rates to move higher. The new normal will continue. This single chart tells the fixed income story of the last 30 years.While there have be upwards jolts, the downward direction is still the same. The declining trend was not broken this year and those that did not follow the Great Rotation were rewarded. Inflation has been down, real rates are low and have been negative, and risk premiums have declined. There has not been a move to some magical mean risk premium so those who have forecasted an end to the long bond trade for asset allocation have been proved wrong. Still, are you being paid enough to hold long bonds until maturity? It is hard to be find that an acceptable risk reward. 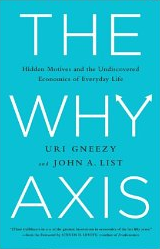 The Why Axis: Hidden Motives and the Undiscovered Economics of Everyday Life by Uri Gneezy and John List is more than just a book about current trends in economic research. It represents the cutting edge of economics and psychology through focusing on how to create effective incentives for different economic problems. For example, how can we get students to learn better or teachers instruct better? There is a misnomer that money is the key to all incentive mechanisms. Pay more and you will get more effort is not always the solution. In fact, money may be a disincentive for effort. The authors show that the simplistic view just does not work in the real world when tested through controlled experiments. The authors provide insights on the hidden motives of individuals which often are not what is expected. If you set up the right experiments, you can learn new insights for problems that have perplexed many researchers. The authors have just scratched the surface, but reader will have their minds racing to rethink their views on incentives. The chatty writing style of the authors can sometimes get in the way of a clear discussion on some issues but the book is worthy read that presents current innovative in economic research. These days, there are many more deep intellectuals in the business, and that, coupled with the explosion of information on the Internet, creates the illusion that there is an explanation for everything and that the primary task is simply to find that explanation. Good quote from a successful trader. Sometimes we just do not know what is causing a price move. Our fundamental models can only explain a small portion of the variation in price, so other means have to be used to profit from price changes. Sometimes market prices move before information is announced. Sometimes prices move because the reason is not available in public information. Sometimes is based on changes in expectations and sentiment which are hard to measure. Other times it is liquidity or flow dynamics. We just have to accept that uncertainty is real and a part of all markets and we have to have models that accept this inherent unknown about price dynamics. What we often call error from a regression is just the unknown and what cannot be explain about the complex dynamics of markets. There is growing pessimism with the IMF as evidenced by the summary in their WEO report. The first paragraph sets the tone of pessimism. The global economy is beset with crisis legacies and a cloudy future. The global economy is slowing and forecasts have been revised down. There is no area where there has not been downward revisions. There is no engine for global growth. Their catch phrase is that increasing growth is "a tall order". Low rates which forces abnormal yield seeking, geopolitical risks, and the threat of deflation make for an uncertain future. In the face of this environment, there has been a change in the IMF policy view. Infrastructure projects are needed to boost aggregate demand becasue monetary policy is not going to get it done. This is the same organization which has always said that the solution for most any global problem is austerity. There is no silver lining in this report. Larry Summers has been on a roll. First, there has been been his arguments on the secular stagnation. Then there has been his paper with a set of authors discussing their thesis that government debt policy has offset the impact of quantitative easing. Now there have been editorials for infrastructure development. Summers has been a one man crew supporting Keynesian policies. While there are other who have espoused Keynesian views, Summers has been using his intellectual prowess to provide a research foundation for his activist views. They should be listened to. Of course, his infrastructure views is just highlighting the key view of the IMF in their latest WEO report which focuses on infrastructure development as a means of helping global growth. This viewed as a major turn-around for the IMF which has usually focused on austerity as a means of solving problems. His current view, which is arguing the IMF point, is that this is a great time for infrastructure development for three reasons. One, infrastructures helps increase the productivity of a economy. Two, infrastructure can provide strong fiscal stimulus. The multiplier when you are in a liquidity trap and have output gaps is much greater than what would be case under normal times. It may be as high as 3. Three, the crowding out at current market levels is limited. If you can finance at low rates, you will get paid back in full. Anytime you can finance at rates below the long-term growth rate of the economy, do it. This could be considered a free lunch. Global growth will continue to be slow in a world of further delevering. If growth is expected to increase and output gaps closed, there needs to be more fiscal work and less focus on monetary policy. A financial rally would continue if we can get a change in fiscal policy. Does congress need to redefine Fed policy goals? Philadelphia Fed president Plosser believes that the Fed's policy goals should be solely focused on price stability. He has gone as far as saying that Congress should redefine or provide more clarity on this issue. This is an interesting question that should be explored more closely. You have price stability, full employment and now macro-prudential goals. In a world of transparency, this high level clarity is critical. If the goal was just price stability, we would have more transparency on action. The Fed would still be loose because inflation is low, but there would be no mistake on what to watch. It seems as though some of the biggest global macro risks are unquantifiable. This means that they are likely to be mis-priced. I would say that pricing will usually be too low because the chance of these events are under-estimated even if we can identify them and the extent of the impact is too low even when they are upon us. Local risks that can carry-over to the global environment are also likely to be under-estimated. This is just a small list of what may be under-priced. 3. Separatist movements. We survived Scotland but this is just the beginning of a growing global issue. -Ongoing issues with weather pattern changes. The biggest policy mistake that central bankers do not want to make is "premature normalization", the action of starting to raise rates to end the QE cycle before it is appropriate. No one wants to commit the original sin of the Great Depression when monetary policy was too tight. We must always remember the apology to Milton Friedman from Ben Bernanke. Any Fed proxy will not commit the action of being too tight. The forward commitment is that the Fed will always err on the side of being too loose. All expectations have to be filtered through this bias. There has been nothing to change this view. The hallmark of monetary policy since the Financial Crisis is the premise that the Fed will not make the premature normalization mistake. The US has overtaken Saudi Arabia as a the worlds 's top energy producer. This is a major change in events which has been developing for years. The US and the rest of the world is still getting used to the new energy power in US production. The US is awash in domestic oil and natural gas. This has destroyed the trade deficits and has changed everything from trade flows to the long-term direction of oil flows around the world. 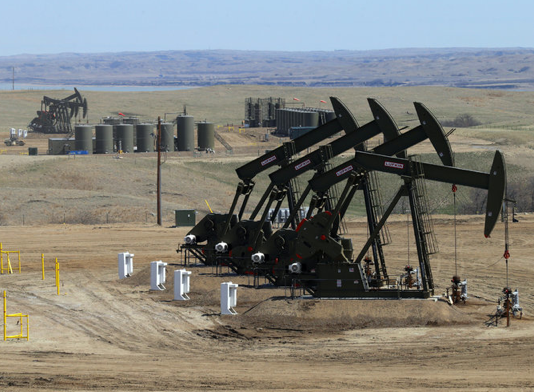 North Dakota, who would have thought, is now challenging many of the OPEC producers as a major energy power. All this means is that there has been another bullet in the peak oil story that has been discussed on an off for the last two decades. The driver of the US energy story is the technology of getting it out of the ground and getting it to market. When technology is improving there will be major change in the supply environment. There is a supply shock but not from geopolitical events, weather, or a logistics breakdown. Supply shocks can come in the form of increases in productivity. The shock will not hit the market immediately, but it can have a longer term impact than the headline shocks that we read about. This just reinforces the old adage that "being long commodities is actually being short technology". Commodities is more about logistics, short-term disruptions in price from supply and demand shocks. Nevertheless, there is a still the same oil game with new players. The issue is whether low cost producers will cut production or will they allow for further price declines to squeeze the high cost producers and allow for a new but lower price plateau. 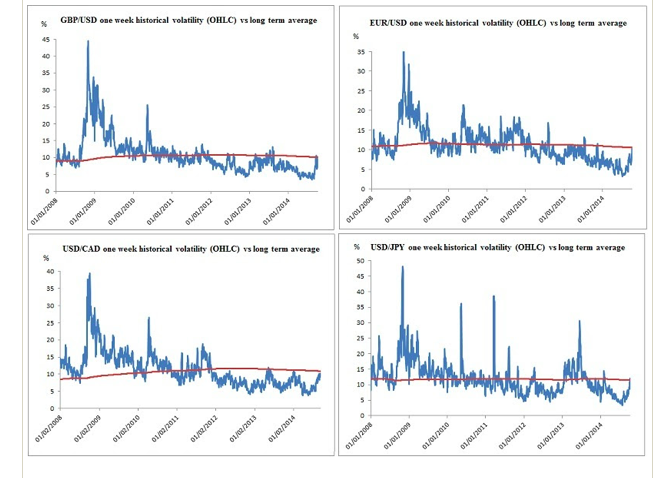 From BNY Mellon, we have a set of charts on FX volatility in a number of major currencies. Volatility is back, albeit it is still less than the long-term averages. With more volatility in major asset markets and more volatility in underlying economic data, there is a corresponding change in the price of money. Money is moving from risky to less risky currencies. Money is flowing with respect to fundamentals. This is all good because the extreme low levels of volatility created an unhealthy risk environment. It is often hard for any investor to think about tail risk. Often the mathematics in this area cause us to lose sight of what investors need to know or how to think about tail risk. Investors are frustrated with trying to make sense of how tail risk could affect their portfolios. They don't have context about unlikely events. A new book on the likelihood of rare events may make some of the discussion on tail risks more real. 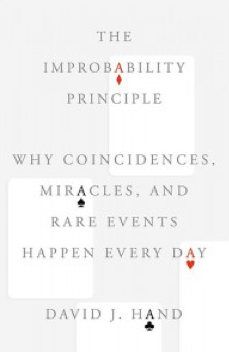 The Improbability Principle - Why coincidences, miracles, and rare events happen every day by David Hand provides a short description of extreme events - why they are more likely and why we misunderstand them. If you are looking for depth and details about some of the key statistics behind on these interesting topics, you will be disappointed. However, if you want a free ranging discussion on many interesting topics concerning rare events, this is is a nice place to start. You will be fascinated by the stories of the author and you will want to learn more after this simple taste on the world of extremes. The Improbability Principle in statistics is simple. Extremely improbable events are commonplace, or certainly more likely than what many think. As the sample size or set of opportunities gets bigger and bigger, the mean becomes more well behaved but any extreme event is more likely to occur. But the author also bring in a set of associated principles that affect how we view the world. For example, there is Borel's Law that says, events with sufficiently small probability never occur or at least we must act in all circumstances as if they were impossible. He gives us the laws of the extreme and unusual jungle. Chance is probability and luck is just chance with a notion of good or bad. We do have to make judgements about good or bad when we say that events will happen. This is just inevitable. In fact, there is also a law of inevitability, something must happen and over enough time it will happen. This is associated with the law of truly large numbers states that with a large enough number of opportunities and outrageous event will occur. Yes, there is the law of large numbers which states that averages will fluctuate less as the sample gets bigger, but the extremes will also more likely occur. This is associated with the law of combinations where highly improbable becomes almost inevitable. We have to appreciate the law of the probability lever, a small change in the shape of the probability distribution will have a significant change in the chance of an event occurring. The stock market crash was a rare event but with a small change in volatility or kurtosis in the price distribution, there could be a multiple increase in the likelihood of an event. A fat tailed distribution makes a stock market crash not just more likely but almost inevitable. Of course, we fool ourselves if we are given enough data. There is also a law of selection describing our biases, if we look at enough events, we will find what we are looking for. This is just another way of saying that we have a hindsight bias. Odd events and patterns will occur and if we use selectivity we will find these odd events. News report are full of oddities because we have selected these unusual events. We also find patterns and similarity because of the law of near enough. Events which are sufficiently similar are regarded as identical. We are always looking for patterns and we find then whether they are there or not. However, patterns are still likely to occur. We should expect extremes and tail events. So the job of the risk manager is not to predict these events but always structure the portfolio so that if these inevitable rare events do occur, the portfolio's performance will not be devastated. Any remaining belief in the commodity super cycle is gone. There is no inflation to worry about so inflation diversification is a thing of the past. Investors now have to think about deflation as the key price risk. Emerging market growth has slowed. The new normal makes developed market growth two percent at best. The asset bubble in equities has not touched commodities where you have to use or convert raw product into something else. The story for buying commodities has disappeared and the same goes for investors. Another disappointing year is developing in commodities led by strong declines in grains and a strong trend lower in energy market prices. The DJUBS commodity index is down 8% for the year. All major markets in the energy complex are all down. Most by double digits. Metals are down except for nickel, zinc, and aluminum. The grain markets have been strong declines based on significant harvests. The exception to the agricultural decline is coffee and cocoa. Livestock has been the only star sector but herds will be bigger by spring. Commodities are an unloved asset class and the global outlook of weak growth is not going to help with extra demand. Rationalization will have to come from the supply side which usually takes time. Producers will have to drop out of the market. That said, commodities on a selected basis may offer better upside as markets adjust to lower levels. I hate to believe in the counter-trend trade when there is limited positive fundamentals, but the beat-up asset class always offers the best opportunities for taking an alternative position. Strategic allocation decisions are always best when markets have fallen. 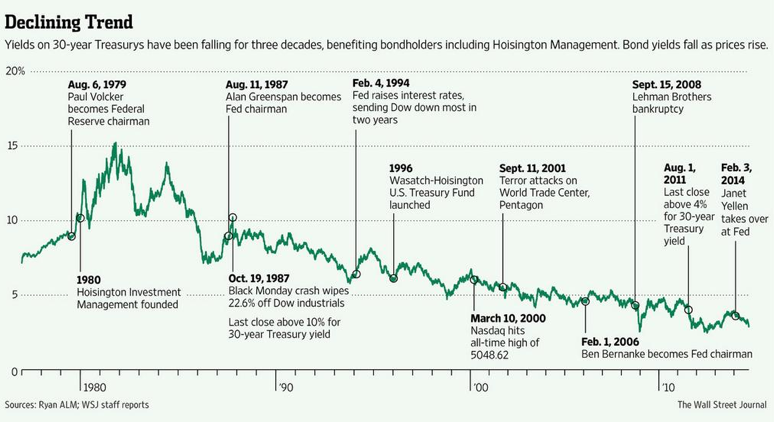 This is an interesting chart for anyone who wants to follow the talking heads of Wall Street. 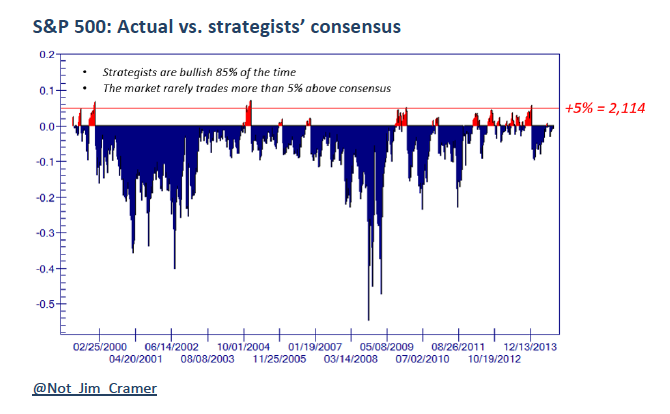 They are an optimistic lot with most of their forecasts fall below their consensus. In fact, if you fade Wall Street you may have a winner. Experts, as usual, get it wrong and you are at risk when you follow their advice. This is another clear reason for doing your own work and following systematic models which do not have the biases of qualitative forecasts. The impact bias is significant. We overestimate the length and strength of feelings we will have about an event. This effects our overall happiness. We can not effectively forecast our emotional reaction to events. We end up more often than not disappointed after some positive event and realize that we were too morose concerning negative events. The cause could be focalism whereby we place too much emphasis on a single event. It is also based on rationalization. We talk ourselves out of both good and bad states. For forecasting, we overestimate what our reaction will be to any large positive or negative event. The result is that we can take action too large relative to what we will feel after the fact. We mispredict our pleasure from any event. This places any forecaster on a emotional roller coaster.Take out the emotions and you will be better at forecasting. Put less emotional investment in a forecast and you will feel better, or at least you will not have the emotional highs and lows. Herbert Simon developed an analogy based on a pair of scissors. One blade is cognition and the other is the structure of the environment or the task to be done. 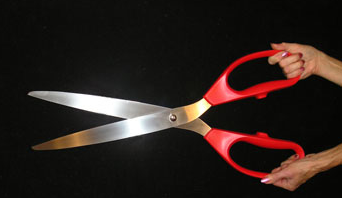 You can understand human behavior only if you look at both blades of the scissors. Our cognition will change with the environment faced. More uncertainty and volatility will affect how we make decisions. Every decision may slow as we wait for confirming information. Decisions will change based on the point in the business cycle of the market to be traded. Context is everything. The best agricultural forecasts can always go wrong for one simple reason, the weather. With a combination of rains and early frost, the corn and soybean crops may not meet the yield expectations of just a few weeks ago. 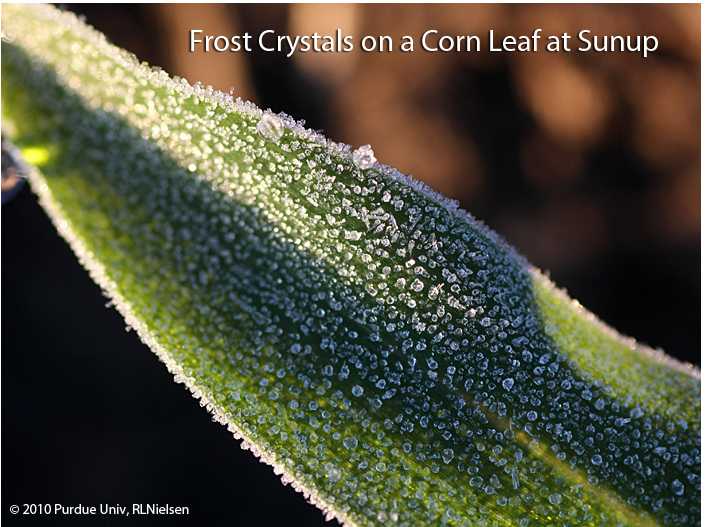 A light frost can cut yields by about 5% and will reduce denting. A hard killer frost will cut yields by 10-12 percent. Rain will slow the harvest which will also affect yields. The high numbers from the South will not hold in the upper Midwest. The current weather patterns are not enough to change the overall direction of price but it will add volatility and cut the downward momentum in these markets. A period of consolidation will occur as the harvest numbers come in and validate earlier forecasts. Mark has over 25 years of market experience on both the buy and sell side of the markets. He was formerly a professor of finance with a focus on futures, options, and speculative markets. He is looking to engage in a dialogue on global economic and finance issues to enhance our understanding of markets. mrzepczynski. Simple theme. Powered by Blogger.